Get pretty with Pixi #20! Sparkly Red Valentine’s Nails! I think there’s an unwritten law that allows only this much red glitter on two days of the year: Christmas Day and Valentine’s Day. 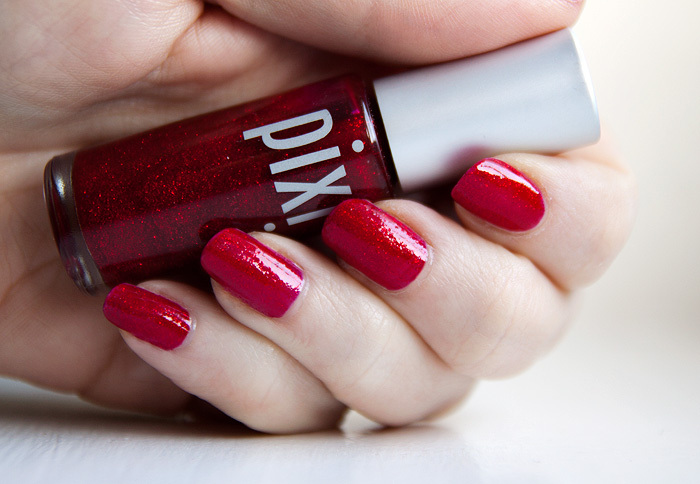 Pixi nail polish in #20 is a dense red glitter suspended in a pink/red jelly base… it’s a proper pow-pow bling-fest on the nails and needs 2/3 coats to ensure even distribution. If you don’t like the rough finish, you’re gonna need a couple of coats of topper to smooth out that much of a glitter party but those brighter flakes sing out loud in the sunshine! That looks stunning. Wow. I bet removal is a pain though! Pretty! I’d totally wear it. Wow that is SUCH a beautiful red!! That’s a gorgeous photo and a stunning shade on you, love it! this red is so so cute! Beautiful colour and very pretty. Reminds me of a glitter red I got from Pop Beauty a few Christmas’s ago. Think it was actually called Xmas. What a yummy looking polish, how did you find it to remove? Was it as difficult as most glitter polishes?